I know this is probably a “teen” novel, but everyone is a “good” guy. There is no real conflict, at least not between any of the characters. The prose is excellent, but I’m not sure I will read the sequel (second half) to this. Also, the characterization of Earth and its species as being unique seems totally unjustified. If I do read the sequel (second half), I would hope the author justifies this assertion. *The Lesser Talisman* is incredible. As a fan of fantasy, I can tell you that you created a new and unusual world. You left Gandalf and Dumbledore our of your book. So many authors create derivative characters, which I find tiresome. Your characters are well-developed, even the tiny ones. I especially liked the multiple stories that became one at the end. Your writing is very skillful, without so many of the trite expressions others use. I was completely enthralled with your story from beginning to end. The advantage of being a reviewer is that it forces me to read genres I would normally ignore. 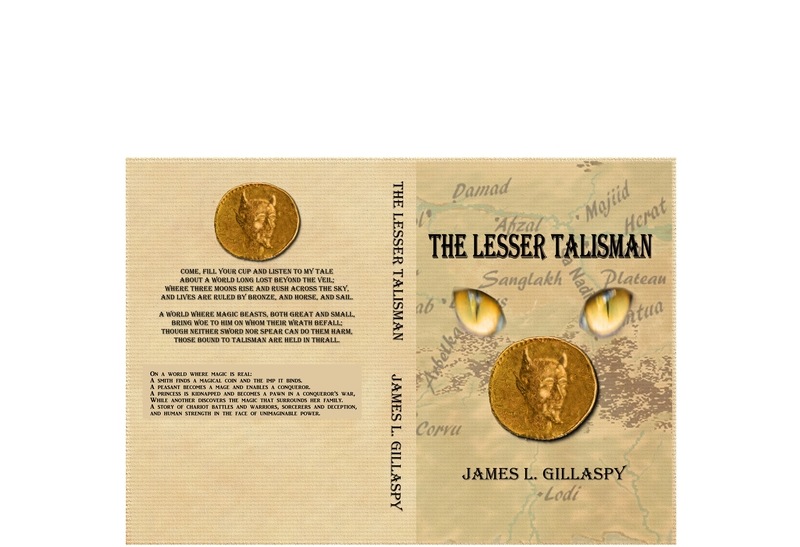 The Lesser Talisman by James L. Gillaspy is in one of those. It’s a fantasy that takes place on a world called Kolahvar at a time other than now. Kolahvar will remind you somewhat of the Middle East, of Aladdin and his ilk, but Gillaspy didn’t want to be bound by the rules of that time, so he built his world somewhere else. His first book, A Larger Universe, is futuristic science fiction, so he’s had experience with this genre. This is the kind of book that makes you relax as you read the first page. You say to yourself, “Aah, I’m in the hands of a good writer.” The beginning may remind you a little of The Hobbit when one of the main characters, Haytham, enters an underground labyrinth of caves and finds something magical – not a ring this time but a coin. The coin is the erstwhile home of an imp, cursed by the Goddess to live in it until it is found and he completes a hundred years of service to the finder. But Haytham and the imp, Kaspir, are only two of the many characters in this book that balances several different story lines. Each of the story lines involves someone dealing with a supernatural being of one kind or another. And each character learns the same lesson: You have to be careful what you wish for. As you would expect, Gillaspy ties the story lines together in the end, and the grand finale is as spectacular as you could hope for. You’ll enjoy this book. On a world called Kolahvar, in a cave near the city of Mantua and three thousand paces from the cave entrance, Haytham slid on his belly beneath a bulging overhang. The flickering flame of his oil lamp, directed by a small mirror, revealed a larger chamber beyond the crawlway, and he decided to continue. Soon he doubted his choice. A leather jerkin and pants protected his body, but the hard muscles of his shoulders, built by a decade of labor over an anvil, jammed repeatedly in the narrow tunnel as he pushed with his hobnailed sandals against the limestone earth. He slipped the lamp into the next chamber and grasped the edge of the crawlway. A moment later, he pulled himself out of the passage and stood on a slender shelf at the edge of a black pool. A cold, damp breeze blew gently past his face, and from some distance came the rumble of falling water. He checked the oil in his lamp. Almost gone, he thought. He hefted the metal flask of oil and spare lamp he carried in a bag at his waist. More than enough to get back. I’ll try for the waterfall, first. The shelf widened into a rocky beach. The sound of plunging water swelled, becoming a roar, and a rock wall, higher than his light reached, blocked the way. A tap of his knuckle on the rock chimed above the thunder of the falls. He slid his hand along the wall’s striped face toward the side by the water. As thin as the spine of my knife blade. Holding his lamp behind the wall made it seem like a rind of bacon, with bands of lighter fat and darker meat glowing in the light. Since his fifteenth summer, he had explored these caves to see the strange and wonderful sights not found on the surface, and this wall was both. He dipped a finger in the water. Cold. No help for it. I’ll get my feet wet. His sandal stirred the silt at the water’s edge as he worked his way around the bacon rind. Something glittered in the crystalline water. He jerked his hand upward, exposing the coin. A diminutive man-like shape rose from the coin’s embossed surface. The figure grew to thumb height, its feet near the coin’s edge, its arms wrapped around a shivering body. He brought his hand close to the lamp. “Please, master, your flame,” the man-shape repeated. Haytham held the lamp closer. He barely finished saying “Warm yourself,” when the figure leaped into the fire and did a whirling dance. Two horns, a spiked goatee, and a barbed tail threw sparks as the wick flared under cloven feet. He opened his hand. The coin, now blank on the upper side, made a small tent on his palm. The coin must be gold. He placed the lamp on the ground and flipped the coin over, exposing a five-pointed star. The imp spoke the truth about the lamp. There is risk to this. Can I believe an imp? The flame sputtered. Even if not, I can’t stay here in the dark. He drew his knife. “Master, what do you intend to do with that?” the imp yelped. Ignoring the imp, He pressed the coin against the blade by the handguard. “Home with you,” he said when he heard the click of gold flattening to iron. The imp disappeared from the flame before it flickered out, leaving Haytham in the complete and utter darkness found beneath the earth. The air chilled, and a swirl of color glowed above his head, gathering to a single point illuminating the beach and wall and casting hard-edged shadows. The coin rested near his knee where he had dropped it. The imp gazed up from its glittering surface. “Perhaps you should hurry,” the imp said. He felt his hands stiffen, and he took special care in filling the lamp. He replaced the stopper on the flask and picked up his flint and knife. A practiced stroke of flint against the spine of his knife lit the wick. “End your light,” he ordered the imp. Once again, they were surrounded by the dancing shadows cast by flame rather than sharp edges from a single point. Haytham gathered and repacked his gear. “Your magic seems nothing like that of my mother’s stories,” he said. With everything in its place, Haytham again wet his sandaled feet going around the bacon rind wall and walked back to the entry tunnel, where he paused and peered into the small opening. How did I get through that? The hole appeared much wider from the other end. He rubbed his shoulders. They still burned from his earlier crawl. Something moved against his waist. Of course. The coin. He retreated a few steps and pulled his jerkin over his lower face. His new position must have satisfied the imp. A fine dust blew from the tunnel, growing in volume until a twisting wind swirled over the lake. The howling died, and the passage cut as straight as the shaft of an arrow through to the other side.